The Lyretail Anthias is the social butterfly of marine aquariums. 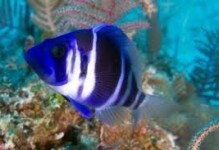 This eye-catching fish is incredibly active and helps draw out shier fish that share the aquarium. 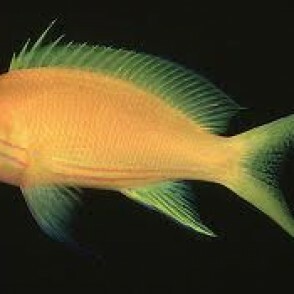 The Lyretail Anthias is also known as the Scalefin and the males have bright red coloration of varying hues while the female Lyretail Anthias tends to be more orange in coloration. The Lyretail Anthias does best when kept in a group and housed in a species-specific aquarium of at least 125 gallons in size. 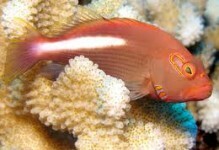 Male Lyretail Anthias are best kept alone or with several females. Though the Lyretail Anthias generally occupy the middle of the aquarium, it appreciates the availability of several hiding places. 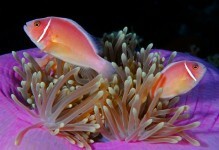 Anthias species all share the trait of being hermaphroditic. If a dominant male perishes, the largest female of the group will often develop into a male to take his place. 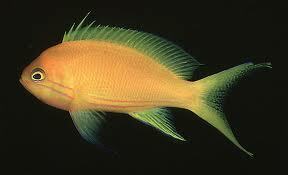 The diet is consistent with other members of the Anthias group – zooplankton and floating filamentous algae. In the aquarium, the Lyretail Anthias should be fed a varied diet of mysis shrimp, vitamin-enriched brine shrimp, frozen preparations and other meaty items for zooplankton feeders. 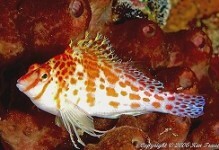 The Lyretail Anthias prefers to be fed small quantities, several times daily.